This cemetery is high up in the mountains between Oporto and Lisbon, in the village of Loriga. The village is 20 kilometres from the nearest city of Seia. There is a bus service (Express Loriga or Express S. Romão; www.rede-expressos.pt) from Lisbon airport, a distance of 292 kilometres from Loriga. It is also possible to take a taxi or a bus from Seia to Loriga. From the direction of Oporto approximately 1 km before the town boundary there is a sign to the right Santuario N. S. de Guia. Follow this road and before the sanctuary is the cemetery. The owner of the bar in the main square of the town speaks English. Cemetery address: R. de São Sebastião, 6270 Seia, Portogallo. Loriga Cemetery is only open on Saturdays, Sundays and Public Holidays from 8am to 5pm. 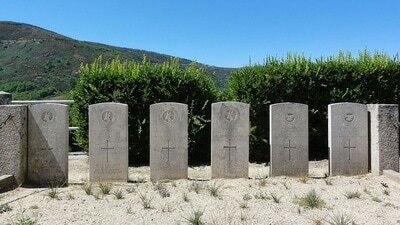 In the cemetery are the graves of six Commonwealth airmen. They were the crew of a Hudson bomber of the South African Air Force and their two R.A.F. passengers, and were killed on 22 February 1944 when their aircraft failed to clear the 1,820 metres eastern wall of the Serra da Estrela at the Penta da Gato. When the headstones had been erected on the graves a service of dedication was held, conducted by the chaplain of the English Church at Oporto. It was attended by members of the British Embassy, Lisbon, a considerable party of British war veterans and almost the whole population of Loriga. 96022v Lieutenant J. Barbour, Wireless Operator/Air Gunner in 48 Squadron, South African Air Force, died 22nd February 1944, aged 29. Son of Thomas Jack and Jessie Barbour, of Edinburgh. 1251612 Corporal Henry Ernest Hedges, 48 Squadron, Royal Air Force Volunteer Reserve, died 22nd February 1944, aged 30. Son of Henry E. Hedges and Emily E. Hedges, of Seaton Burn, Northumberland. 205812V Captain Robert Taverner Hildick, Pilot in 48 Squadron, South African Air Force, died 22nd February 1944, aged 21. Son of Benjamin Herbert and Alexandra Hildick, of Johannesburg, Transvaal, South Africa. 102267V Lieutenant J. P. Thom, Wireless Operator/Air Gunner in 48 Squadron, South African Air Force, died 22nd February 1944, aged 25. Son of James and Agnes Crossau Thom, of Observatory, Cape Town, South Africa. 942985 Corporal Jack Learoyd Walker, 48 Squadron, Royal Air Force Volunteer Reserve, died 22nd February 1944, aged 26. Son of Bernard Learoyd Walker and Sarah Jane Walker. 542244V Lieutenant Daniel De Waal Walters, Navigator in 48 Squadron, South African Air Force, died 22nd February 1944. Son of Daniel and Georgina Henrietta Walters, of Woodstock, Cape Province, South Africa; husband of D. Eileen Walters (nee O'Connell), of Bloemfontein, Orange Free State.